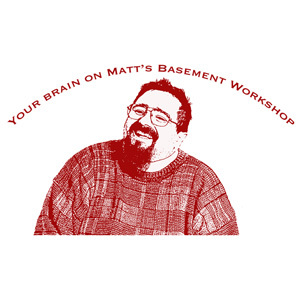 “Your Brain on Matt’s Basement Workshop” t-shirts are being marked down to make room for more inventory. As the cooler weather isn’t that far away, some of you are asking for long sleeve shirts, and there’s even the chance a special “CHORTLE” design could be in the works too! 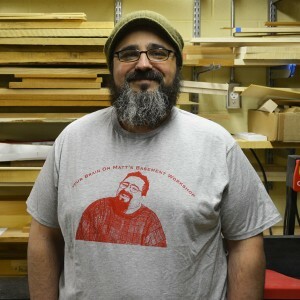 The “Your Brain on Matt’s Basement Workshop” t-shirts are a lightweight polyester/cotton blend that are comfortable to wear in OR out of the shop. Sizes are limited to what we currently have in stock, ranging from Medium to 3XL. So hurry before they’re sold out. The price per shirt doesn’t include shipping and handling. Shipping and handling charges are a flat-rate fee* for domestic shipping in the USA that will be added to the order at checkout. For international orders please contact me directly to order so I can determine the proper shipping charges prior to purchase. Email me using this link. “Your Brain on MBW” – Sale Price! Want to order both “Your Brain” and the “MBW Classic Logo” shirts together? CLICK HERE TO VISIT THE MBW T-SHIRT PAGE. *Why a flat-rate fee? The weight of the t-shirts and packaging take them very close to not being eligible for 1st-class shipping rates, so to make it easier for the shipping department (me) and to keep costs low, I’m currently only offering the one form of shipping unless indicated.